The Crafts Council of Ireland and The Irish Architecture Foundation asked architects and crafts people to collaborate in producing a design for a craft pavilion at Electric Picnic. 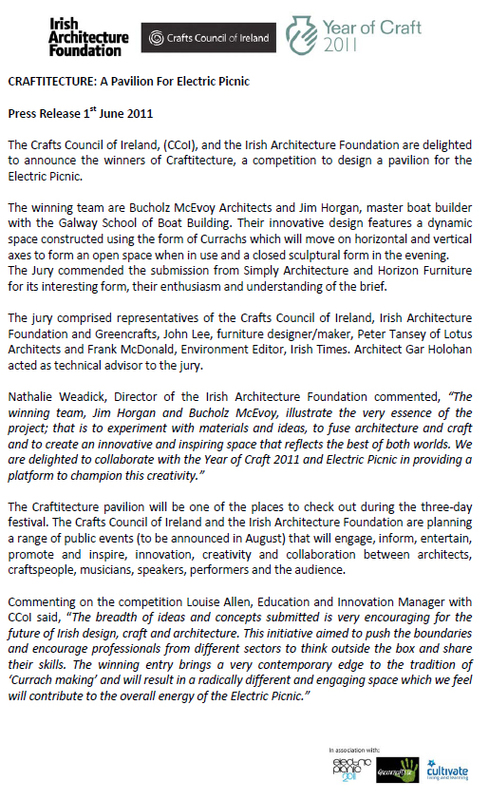 Our design, in collaboration with Horizon Furniture, was placed 2nd in the national competition with Bucholz McEvoy Architects and boat builder Jim Horgan winning first place. The winning entry was built and used at Electric Picnic for a variety of exciting events. We were honoured to receive a commendation for our entry and also to speak about our work in the winning pavilion at Electric Picnic.